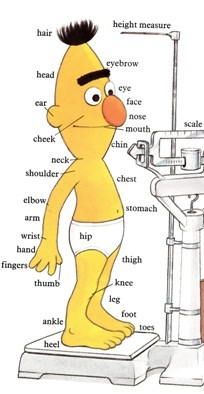 I wrote a lot of words about a word book yesterday, which seems appropriate, but, to be honest, reading the 1983 edition of The Sesame Street Word Book is a primarily a visual experience. 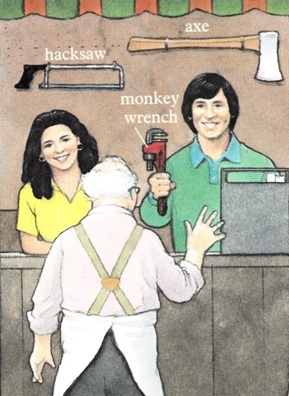 It’s telling that there isn’t an author listed for the book – the only credit on the cover is “illustrated by Tom Leigh.” Because, while it is great that The Sesame Street Word Book teaches us obscure terms like “pancake turner”, “otoscope,” and “hod carrier”, the real fun of the book lies in Leigh’s illustrations. 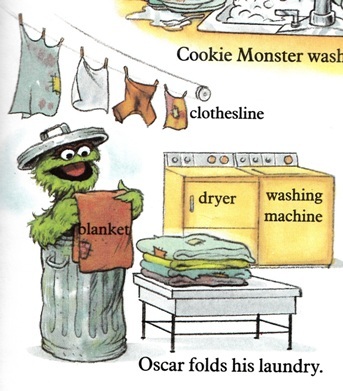 So, in an attempt to convey just what an entertaining book this is to flip through, here are my personal picks for my fifteen favorite illustrations from The Sesame Street Word Book. Some of these are sweet, some are funny. Some are unintentionally funny. Some are only funny because they remind you that, yes, this book was indeed published in 1983. But, regardless, they all just make me love this book all the more. 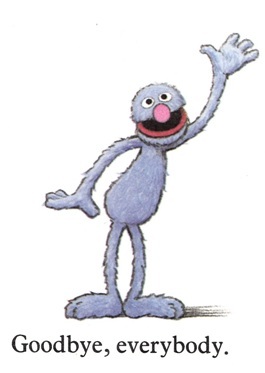 Question: What’s cuter than a semi-obscure Sesame Street character saying “Hello”? Answer: Nothing. 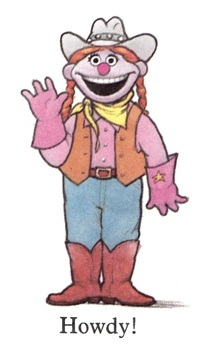 Have a great rest of the day, Rodeo Rosie. 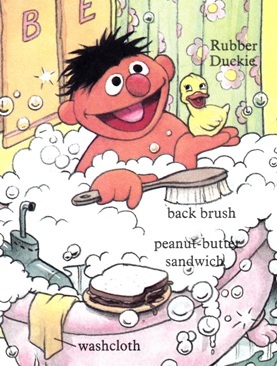 There is a recurring visual joke that runs throughout a lot of Sesame Street books in which the perpetually bathing Ernie is always pictured with a sandwich that he has apparently brought into the bathroom with him. 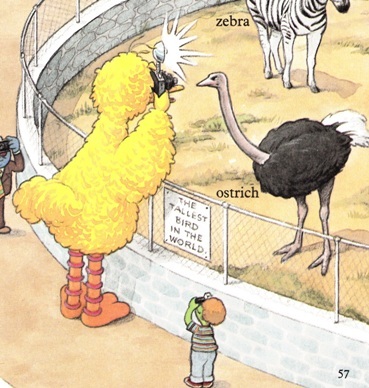 (It shows up pretty often in the 1980s Sesame Street Book Club books.) This is both hilarious and really, really gross. 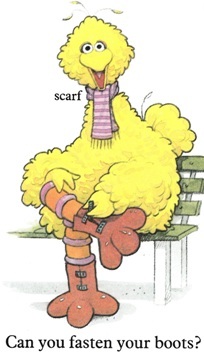 Where did Big Bird find boots that match the shape of his feet exactly? Did he have them made? This is just… oddly creepy. 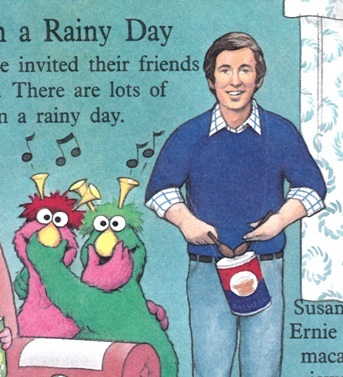 If you look very, very closely, you will notice that Bob’s oatmeal-can drum is actually suspended around his neck by a very thin, hard-to-see string. Because… yeah… insert your own Andy Samberg/Justin Timberlake joke here. Wait, look at the clock. Did Farley’s grandmother seriously make them steak, mashed potatoes, and peas for lunch? Who does that? Listen to your grandkids next time, lady, and make with the peanut butter. 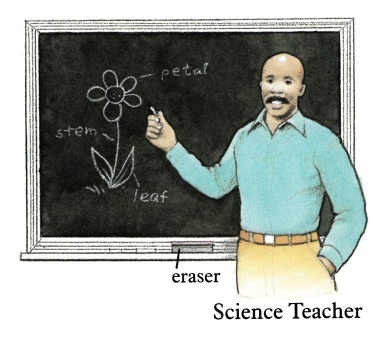 I love how much this picture makes absolutely no sense. This picture is totally appropriate within its context, but there’s just something about seeing a Muppet in their underwear that feels exceptionally WRONG. You know what else feels wrong? Seeing a Sesame Street Muppet get angry. I mean, I like it – it shows that they’re human, but… I’m a little scared of Prairie Dawn in this picture. I’m sure there are some really strong members of the current Sesame Street human cast, but, when I was a kid, Gordon was THE MAN. He and Susan were like the reigning king and queen of the block. 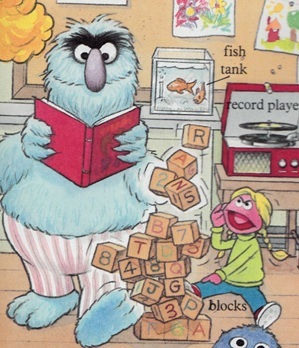 When watching DVDs of classic Sesame Street episodes with my daughter, I always love catching the few and fleeting references to Mr. Hooper’s Judaism. 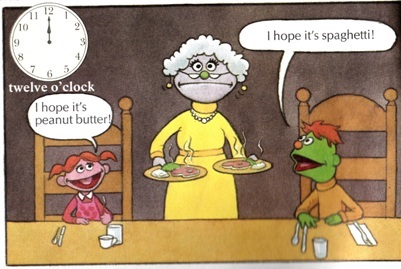 (The most concrete example I know of was the semi-condescending “Happy Hanukah” that Bob shot Mr. Hooper in 1978’s “Christmas Eve on Sesame Street” special.) 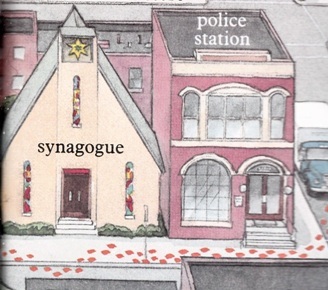 So, I was really happy to see, in this larger Sesame Street cityscape, that they even included a place for Mr. Hooper to worship in peace. 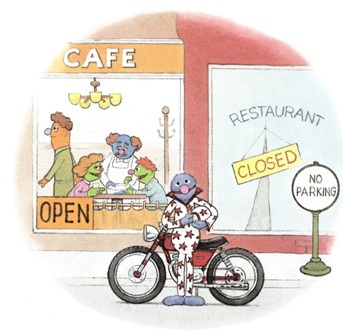 Of course, Grover has his own motorcycle and Evel Knievel jumpsuit. Of course, he does. 13. Luis, What Are You Doing? HELP! Taken out of context, this image is downright chilling. While I do sometimes miss the vibrant, urban vibe of early Sesame Street episodes – when it really felt like the characters were living in a real, lived-in metropolitan area – I really can’t get behind the concept of a homemade shish-kebab cart pulled by a dog. You have to draw the line somewhere. Bloomberg would shut that thing down in New York minute and rightly so. Nobody, in the history of the world, has ever pronounced the word “everybody” better than Grover.